This course is perfect if you want to drill the basics, drink from the fountain of health or face your inner worst demons. As a student you will be challenged and forced by your own hand to analyze what you're actually doing in your life, as in terms of behavior, life purpose and future destination. Is Fate what we make? My inspiration for this piece of literature comes from Dr. Paavo Airola. His book How To Get Well is beyond exceptional and truly a must read. I'm so glad I had a chance to read it. I've learned that it is all about balance and quality. Life should be analyzed in every way. What path should we take to lengthen our telomeres or at least try and prevent them from getting shorter? How do we know what to do? This course is about what to do. This CHI Course Elective reviews the steps that are necessary to understand and apply for those searching for better health and optimum wellness. It includes the book Recipe For Health in both audio MP3 format and a written PDF manuscript. Students will learn how to live and get well and derive motivation to apply necessary change. This course defines optimum health and describes the ten principles steps essential to its achievement. It serves as an ideal introduction to the world of alternative health care, holistic sports nutrition and fitness. Discover the key ingredients you need to create your own Recipe for Health and learn the secret of true motivation. 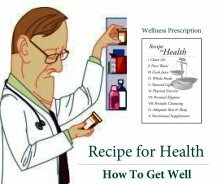 Do you know How To Get Well? Student assignments and exams include listening to specific SNU audio files in MP3 format and reading specific sections of the ESN.